Apple Cream - Miss J Chaytor Take eight apples, pare them and core them Boil them till they are quite soft add the peel of a lemon to them, put them through a seive with as much loaf sugar as will make them sweet, and as much cream as will make them a light colour, then put them in glasses & make a high froth on the top. 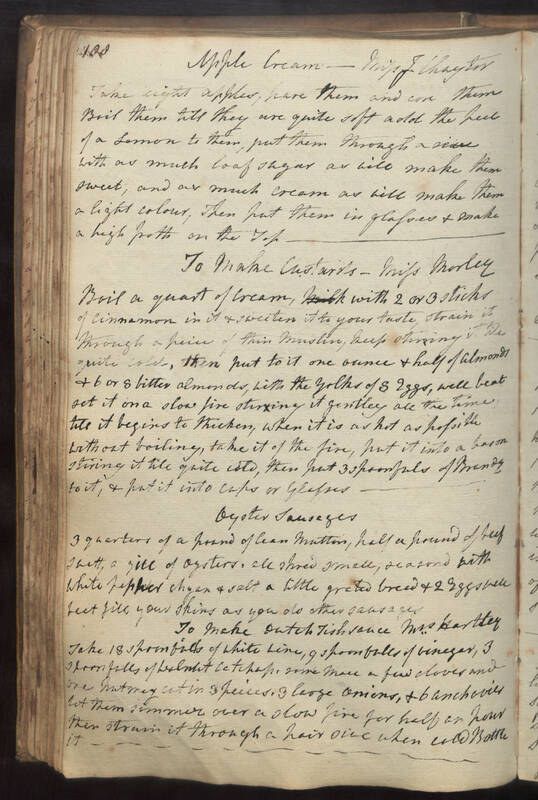 To Make Custards, Miss Morley Boil a quart of cream, with 2 or three sticks of cinnamon in it & sweeten it to your taste, strain it through a peice of thin muslin, keep stirring it till quite cold, then put to it one ounce & half of almonds & 6 or 8 bitter almonds, with the yolks of 8 eggs, well beat set it on a slow fire stiring it gentley all the time, till it begins to thicken, when it is as hot as possible without boiling, take it of the fire, put it into a bason stiring it till quite cold, then put 3 spoonfuls of Brandy to it, & put it into cups or glasses. Oyster Sausages 3 quarters of a pound of lean mutton, half a pound of beef suett, a gill of oysters, all shred small, seasoned with white pepper chyan & salt a little grated bread & 2 eggs well beet fill your skins as you do other sausages To Make Dutch Fish sauce Mrs Hartley Take 18 spoonfulls of white wine, 9 spoonfulls of vinegar, 3 spoonfulls of walnut catchup, some mace a few cloves and one nutmeg cut in 3 peices, 3 large onions, & 6 anchovies let them simmer over a slow fire for half an hour then strain it through a hair sive when cold Bottle it.